Britain's fourth biggest insurer, Friends Provident froze its Property Fund on Thursday, thereby denying over 110,000 investors the ability to liquidate their investments. The property fund has an estimated value of more than £1.2 billion or $2.5 billions. The insurance company stated that investors will not be able to gain access to their funds for a period of six months due to a sharp fall in its cash reserves as investors took fright from the collapsing UK housing market, both residential and commercial. Over the last 20 years, I have repeatedly warned of the problems faced by unit trust holders in that in times of difficulty they may find themselves locked into depreciating assets without the ability to liquidate investments. The first time I experienced this was during the 1987 crash, when I did hold unit trusts and the brokers would fail to pick up the phone, this has been reiterated throughout many articles regarding how to invest in funds, and that my preferred route has always been to invest in investment trusts rather than unit trusts. 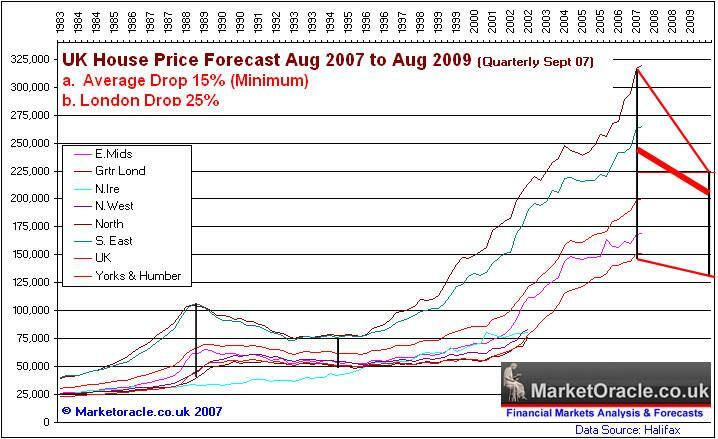 Back on 22nd August 07, I specifically warned in the article - UK Housing Market Crash of 2007 - 2008 and Steps to Protect Your Wealth , The stock market is expected to be volatile since we are moving into a new risk climate. Despite a high probability of further sharp falls, and even a crash, there are plenty of long-term plays out there especially in the big cap oil sector. I would also look at bargain hunting metals and mining on further sharp falls or a crash. Similarly for the utilities sectors such as Water. The best plays are probably via investment trusts, of which there are many. I favor investment trusts over unit trusts as they are traded on the stock exchanges exactly as any stock is. Whereas, as I recall in previous financial crisis you may find the phone off the hook on the other end of the line when you try to call to buy or sell unit trust positions. The reason for the freeze is clear, in that once the cash reserves have been consumed the funds would be forced to liquidate assets, which means sell properties. Do not imagine for a moment that the problem is restricted to Friends Provident. This applies to ALL commercial property funds that are seeing the smart money leaving the scene before the avalanche of redemptions begins resulting in sector wide freeze of unit trusts. The UK housing market continues to deteriorate and is expected to result in annualised UK House price inflation going negative for the first time since the early 1990's by April 2008. The buy to let sector rush for the exit to take advantage of the change in UK capital gains tax rules effective 1st April 2008 as well as buy to lets no longer remaining a viable investment in the face of falling house prices. An additional sign of the housing slump accelerating was illustrated in my recent analysis of the sharp deterioration in the ability of houses to sell at auction, with the number of sales falling from 97% in January 2007 to 71% by November 2007, typical auction house. The Market Oracle forecast is for a 15% drop in UK House over the next 2 years with London expected to drop by as much as 25%, as of 22nd August 07. The UK property market remains at historically high unaffordability levels as illustrated by the Market Oracle UK House Price Affordability Index. Your 'renting' analyst watching the unfolding UK housing crash from the sidelines and preparing 7 additional 2008 inter-market forecasts in addition to the 3 already produced (UK house prices, inflation and interest rates). Next - UK GDP growth for 2008 and hence recession prospects. Nadeem, you say the freezing of assets of unit trusts does not apply to investment trusts, can you tell me what about the position of ETF's? Where do they stand? Can they be frozen or are they treated as investment trusts. ETF's trade the same as investment trusts and individual stocks, in that an open market is made for their shares and can thus be bought and sold at any time during market hours. By the way, they 'could' be frozen as any traded stock 'could be', but I cannot recall ever an ETF or investment trust being frozen due to a market panic. Whereas there are a string of precidents of unit trusts and other similar investments being effectively frozen either through announcements or the fund manager not picking up the phone to deal. The reason is because Unit trusts have to liquidate assets to meet sellers demand if they run out of cash, as is happening with the property unit trusts. Whilst investment trusts assets are NOT sold to meet seller demands, as the market matches sellers to buyers i.e. the price falls until buyers emerge to buy the stock being sold. Nadeem, do you think an investor has any come-back on poor advice given by a property fund manager? E.g. if in early Q4 he/she was still forecasting positive returns after a 10% YTD fall, yet the fund ended up losing 20% by year-end? Maybe the advice was given to avoid too many redemptions? I doubt if there is any comeback, as all forecasts would carry a disclaimer. The only comeback would be if you were mis-sold an investment.